Yeah, so, the Santa Fe Shawl? Not done. I took a break for a couple of days to make my Chrysanthemum Tea Skirt, which I totally love and wore this past Friday, but utterly failed to get pictures of. Anyway, I tried to get back into working on the shawl, but between the soul-crushing boredom with making all of the little motifs* and the need to get ready for guests this weekend (and next weekend), it just didn’t get done. It will, eventually, but it’s not there yet. And you may remember why it was that we had guests this past weekend – this was the porch-raising party. Unfortunately, due to some redesigning-on-the-fly, we didn’t get anywhere near as far as I had hoped, so we still have no roof. Kris and I are working our way through hanging the joists, and I am hoping that we can get them all up in the next week or so. 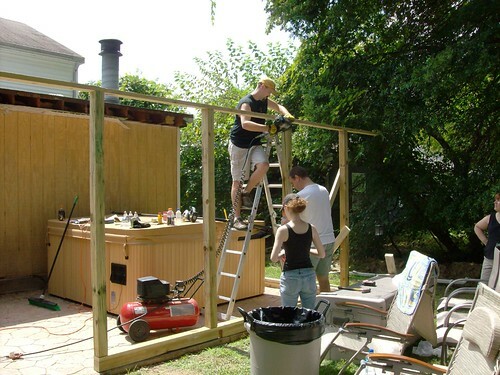 At that point, I’m going to beg/bribe/whatever it takes our friends to help us get the plywood up onto the roof so we can place it, because that is NOT a job he and I can do by ourselves. The joists, and the paneling for the lower parts of the walls, totally. A couple of highlights from the weekend – the rest of the pictures are in the Flickr set, starting here. Starting to look like walls! My folks will be arriving this Wednesday for a few days, so we’ll see what all we get done. *Next time I say I’m going to make a project that involves lots of little pieces that have to then be put together, someone slap some sense back into me, ok? I don’t like doing it, I get halfway through, and I want to stab my eyes out. And yet, I continue to do it. And no, sweater pieces don’t count. It’s looking awesome! I can’t wait to see it all done. 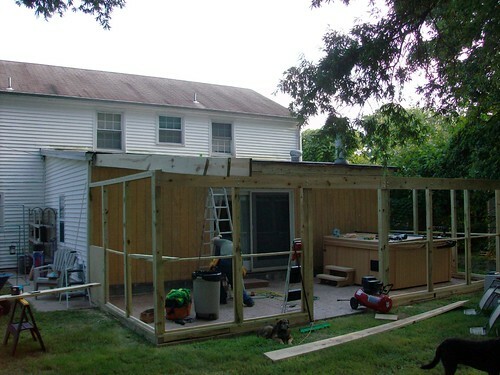 Is this going to be a screened porch? I’ve always wanted an outdoor hot tub. A friend of mine (2 jobs and 10 years ago) had one and it was awesome. Can’t wait to see the skirt! 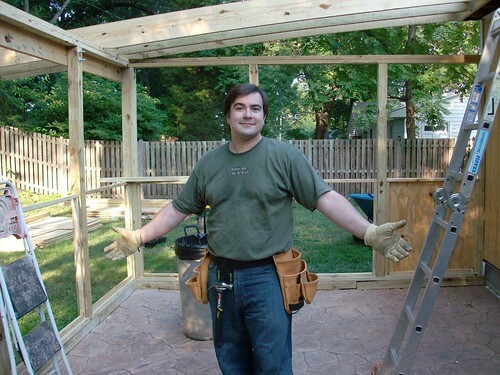 Kris looks great in a toolbelt – all men should wear one… although my hubs would disagree very strongly. Kris could totally be Captain Hammer. Without all the dumbass, of course.